Steve’s breakdown: Samsung doesn’t even have a name for the foldable phone but we suspect a few calls to their marketing folks are in order. Pretty ad are nice but we think some tech talk might be the ticket to better sales. RICHARDSON, TX: Samsung just announced a smartphone that can fold in half. It’s a compelling form factor that may one day allow us to carry phones that fit snugly in our pockets but that can then be unfolded to reveal a larger screen, like a tablet. The phone, which doesn’t have a final name or design yet, uses a new display technology Samsung calls the Infinity Flex Display. 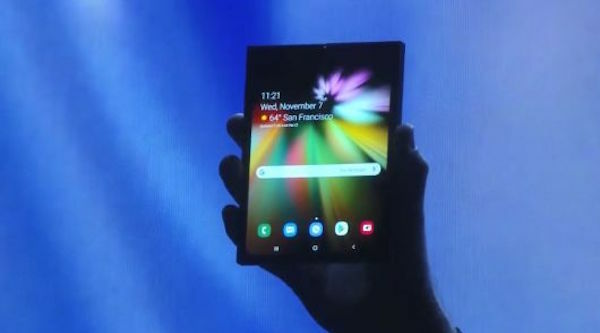 The foldable phone was finally revealed during the Samsung Developer Conference 2018 Opening Keynote on Wednesday. The company’s head of mobile, DJ Koh, has been teasing this sort of device for several years and most recently spoke with CNBC about it in September. Samsung won’t be the only one to release a foldable phone. Google on Wednesday said that Android now officially supports foldable devices. While Samsung is one of its partners that will release a product first, it’s likely other companies will quickly follow with similar products.